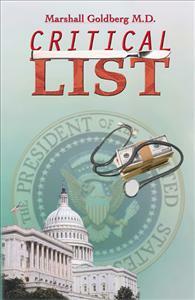 HE’S AMERICA’S #1 DOCTOR AND HIS PROOF OF A MASSIVE HEALTH CARE SWINDLE COULD BLOW THE WHITE HOUSE APART! HE’S AMERICA’S #1 DOCTOR AND HIS PROOF OF A MASSIVE HEALTH CARE SWINDLE COULD BLOW THE WHITE HOUSE APART! Dan Lassiter’s brilliant achievements have rocketed him to the most influential medical position in the nation. His future seems assured until an old friend, a mysterious black man who tops the FBI’s list of subversives, forces him to choose between his career and his conscience. Lined up against him are a group of corrupt politicians, hospital administrators, and possibly the President himself. Lassiter has one weapon left to expose the two billion dollar theft of Medicare and Medicaid funds and he intends to use it in the most public of forums – even if it destroys himself and the President of the The United States.